Whispering Oaks Ranch is a 50-acre, private property located in the LaSal Mountains, near Moab, Utah. Our seven luxurious cabins offer overnight accommodations for 12-65 guests. A 2-night minimum stay is required. Guests who wish to rent our facilities for hosting an event have access to a number of convenient amenities. For smaller groups (10-40 attendees) : The Cedar Bend Lodge (in addition to the nearby cabins) may be reserved for overnight accommodations and venue space. 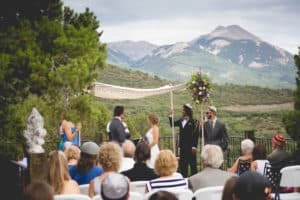 The 6,000 sq ft Lodge along with its outside decks provide beautiful views for an intimate wedding ceremony and reception. A couple of key policies to note: All event guests must be staying within the onsite accommodations reserved. If fewer than seven cabins are needed for overnight accommodation, the outside music curfew is 9pm. Additional policy information, event photos, inventory, and rental items list are available upon request. Reserve all seven cabins and our covered pavilion (additional cost). The pavilion is situated right in the middle of a 55,000 sq ft lawn with views of the La Sal mountain peaks. A ceremony may take place in any section of the lawn or at the ceremony deck. The entire area provides excellent views of the La Sal Mountain peaks and gives immediate access to the pavilion. 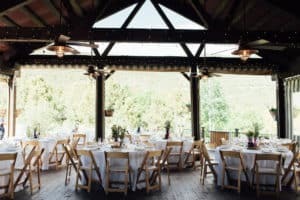 Amenities such as a stage, dance floor, caterer’s prep room and tables create an ideal outdoor venue space for weddings, family reunions and group retreats. Please inquire for additional information and availability.